If you’re searching for effective, affordable Sandy Springs pest control, give the experts at North Fulton Pest Solutions a call. We’re ready to handle even the worst infestations you run into. Let us help you take back your property and get back to enjoying a comfortable and secure home. North Fulton Pest Solutions is the number one source for comprehensive Sandy Springs pest control services. We’re prepared to deal with problems located in or out of your home and offer you the most effective solutions available in the area. We’ve been in business for more than 45 years and understand the unique needs of Sandy Springs residents. Georgia is a hotbed for insect activity throughout the year. The climate supports more species than the majority of the US. To that end, homeowners here deal with fire ants, termites, cockroaches, mosquitoes, venomous spiders and other harmful bugs. The expense and amount of damage that termites cause can be overwhelming to homeowners. 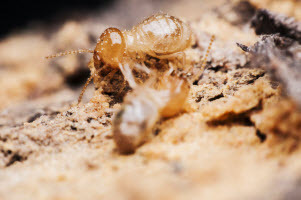 In Sandy Springs, termites are extremely common, causing homeowners to seek termite control solutions from professional service providers. At North Fulton Pest Solutions, we treat your home and property using some of the most advanced, effective products available so we get the job done right. Our Damage Repair Guarantees combined with our Lifetime Renewable Guarantees will safeguard your home and property against the damage and costs that termites can cause. The termite products we use to protect your home are some of the most effective available. These products are proven to provide both preventative termite protection and control of active termite infestations. Sentricon® Termite Colony Elimination System with Always Active™ Technology. This is a green alternative product that is used to protect the White House and many other national treasures from termite infestations along with millions of other homes – so why not yours? It kills individual termites, the termite queen, and ultimately the entire termite colony. Many other types of termite “bait systems” do not contain active termite bait when they are installed. However, every Sentricon® with Always Active™ bait station is loaded with Recruit® HD termite bait on day one providing around the clock termite protection! Termidor® Termite Treatment. Termidor® is a non-repellant, liquid residual termiticide that kills individual termites and contaminates the colony by means of its “Transfer Effect™”, providing complete termite control. With the Termidor® “Transfer Effect™”, the termites in your home will be dropping like dominos for total termite control. There are two companies in the Sandy Springs, GA area that participate in the Builder’s Club program. North Fulton Pest Solutions is one of them, and builders can earn Club Points by purchasing our preconstruction termite treatments. The termite inspection is the first step in termite treatment plans or any termite services. Our preferred hybrid approach to termite protection combines a baiting method (Sentricon® with Always Active™) with a liquid residual treatment (Termidor®) of critical areas conducive to termite infestation giving you and your home the best of both worlds. We’ll conduct a termite inspection of your home and property. If we find termites we will help you determine the best way to handle the situation and ensure we develop a plan that will get rid of your termites for good. If we don’t find termites, we’ll prepare a preventative plan to keep your home continuously protected into the future. Termites are always a concern when you are selling or buying a home. A Sandy Springs termite inspection and the Official Georgia Wood Infestation Inspection Report (sometimes called a “termite clearance letter”) are necessary steps in the process that both the buyer and seller must take in order to ensure a home is properly protected from termites and other wood destroying organisms. Real estate agents and homeowners can submit their request by using our convenient form that is located right on our website. Preventing a colony from taking hold of your property is the first step in avoiding expensive termite damage. These gnawing, chewing insects destroy the wooden components of your home and cause Georgia residents millions of dollars each year. Much of this isn’t covered by insurance, as pest-related problems are considered maintenance issues. Safeguard your home with our preventive termite control measures. We will also help you in the event of an infestation. We work with the two top-performing termite control products currently on the market. Termidor® and Sentricon® with Always Active™ work on the root of a termite problem, taking out the queen of the colony and killing off other termites at the same time. Dozens of scientific studies prove the superior quality of these applications. They’re notably effective in even the worst situations. In addition, we perform in-depth termite inspections and will provide you with termite clearance letters in record time. 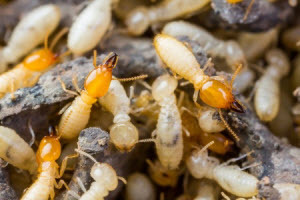 North Fulton Pest Solutions provides complete, professional termite control in Sandy Springs, GA. Give us a call and we will work with you to develop a termite control plan that most effectively meets your needs. If you think you have termites, know you do, or are looking for termite protection, we can help. The wildlife in Sandy Springs is mostly found in parks and perhaps the occasional yard, but sometimes it finds its way into your home, and this can cause real problems. You can’t really blame them, though. As man has consistently pushed back the boundaries of their natural habitats, they have been left with fewer and fewer places to call home – so they wind up moving into human dwellings. Bats, raccoons, squirrels, rats, mice, skunks, and opossums may seek shelter in the crawlspace, basement, garage, or attic of a home. Wildlife removal in Sandy Springs is often the only option for getting rid of the animals and keeping them out. True, squirrels and raccoons, even skunks, look like cute, cuddly little animals, but when you have one in your home it can be quite costly. They can chew the wires to your AC or even your entire home electrical system. An animal that is looking to nest can tear up your boxes and the contents inside. If a pet or child encounters one of these animals they could be injured, even bitten. Wild animals can also introduce pests like fleas, ticks, and mites into the home. Some of these pests are carriers of diseases such as Lyme disease. Wildlife extraction is not easy though and not recommended for someone not licensed in GA for wildlife removal. The state has strict laws regarding how wild animals are to be removed from a home, and failure to comply with these laws can result in legal trouble. Of course, there is also the risk of injury to someone who is not trained and certified. A professional wildlife removal technician understands GA law and will remove wildlife in the most humane way possible while minimizing risks to humans and pets. They will also provide advice on prevention strategies to keep the animals out of the home. Let the pros at North Fulton Pest Solutions help keep nuisance wildlife out of your home. We’re licensed in GA wildlife removal in compliance with state law; so, when one of our knowledgeable technicians answers your call, you know you are getting the best. 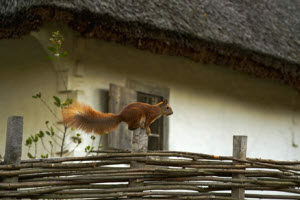 Don’t let the presence of wild animals in your home pose a health or safety risk to your family and pets. We’ll give you fast, friendly service. When you need wildlife removal in Sandy Springs, we’re here to help. The wildlife control experts at North Fulton Pest Solutions actually hold trapper licenses issued by the Georgia Department of Natural Resources. We specialize in humane removal and exclusion methods. Squirrels, bats, raccoons, rats, mice and other animals enter your home to take shelter from the elements and from other predators. They often leave to hunt for food and return again when it’s time to sleep. Whenever possible, we take advantage of these cycles by installing one-way traps designed to let animals out while blocking their re-entry. Once it’s certain any unwelcome guests are gone, we work to block all potential entryways into your home. For three generations, North Fulton Pest Solutions has been providing Sandy Springs homeowners with effective, affordable fixes for all kinds of bug and pest-related problems. Give the Sandy Springs pest control experts a call at 770-475-7419 for a free quote.